Thank you for visiting the ESSC website. Whether you are new to sailing or a seasoned pro a warm welcome is extended to all new members. 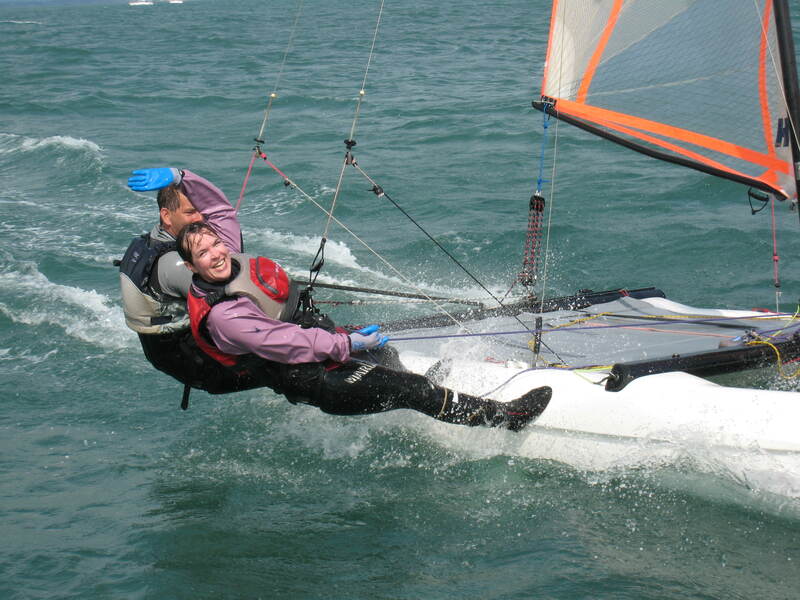 ESSC is run by and for its members with the aim of promoting and facilitating amateur dinghy racing and sailing. The Club members run a number of sailing courses for all ages to help get you out on the water and start the fun. We have a number of club boats and with superb club house facilities, bar and restaurant ESSC is the premier sailing venue in the South east. There is a great social scene at ESSC with many events throughout the year from regular themed nights from Pimms on the prom in the summer to the formal Dinner and Dance at Christmas. Families are very welcome! – There is a long tradition at ESSC of generations of the same family being actively involved. With one of the best Training centers of any sailing club we will have soon get the confidence to go sailing. So, how about joining ESSC. There a number of membership categories’s to cater for singles, couples and families, sailors and non-sailors. Paying online? Please let us know. Download a membership form here Application Form 2019- Standard. What is the Sailing Academy? The total cost of this package is £370. This scheme is not available to existing club members. The full fee must be paid at the start of training—standing order or direct debit arrangements are not available with this package. There is a mandatory induction evening to attend which is on Wednesday 1st May at 7:30pm. The following Saturday, (4th May), will be the first training day, from 10am to 5pm. Training continues every Saturday until the weekend of 1st & 2nd June, where we use both Saturday and Sunday to finish the course and sign everyone off. This also gives you a chance to see club life in full swing and be introduced to other club members! And hiring a club Pico costs £10 every time you want to go sailing for those not in the Academy. Add all of these up and you can see that Academy membership really is a good deal. Plus you would be joining a club with an active social programme, our own bar and galley facilities. With a whole year to see if you really are keen to carry on with the sport of sailing. All for just £370! 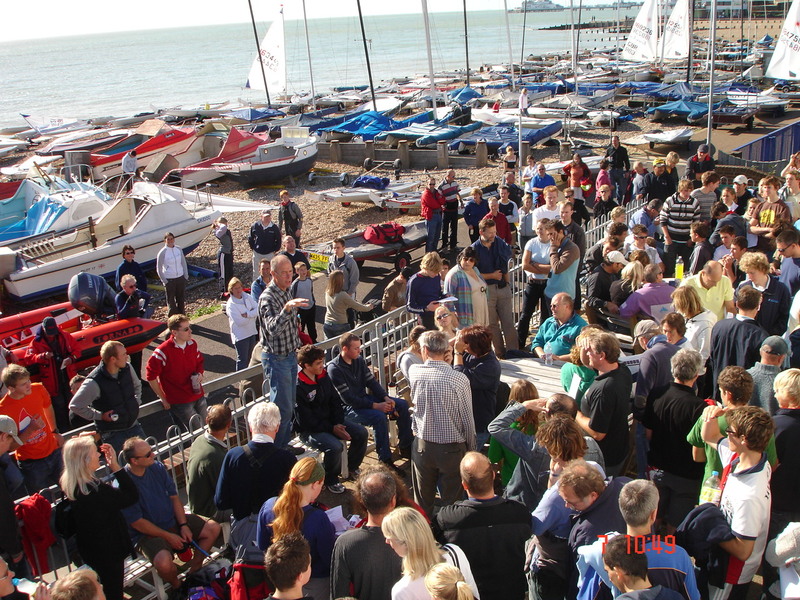 So come on, join us and look forward to a year of Sailing at Eastbourne, making new friends and enjoying a great sport. Is there a level of fitness required? In general, sailing is a fantastic sport which is accessible to all people regardless of their disabilities or levels of fitness across the UK. However, Eastbourne Sovereign Sailing Club does not have any slipway access and uses adult single handed boats for training. As such a good level of fitness is required. This can be compared to walking up and down a shingle beach carrying bags unaided and climbing out of a swimming pool without the use of a ladder. If you are concerned about your ability to complete this course please arrange a chat with one of our instructors before booking onto the course. Due to the limited availability of this course we are unable to offer refunds should you choose not to complete the course. Most boats sailed at the club are owned by members. Often there are opportunities to crew for someone, and this provides a good way of trying out different boats before buying one for yourself. The club boats are also available for you to use free of charge on club sailing days for the remainder of your 12 months membership. This is an excellent way of gaining more experience with others who have recently started the sport. The boats are available on Wednesday evenings, all day Sunday and, subject to availability, on Saturdays. 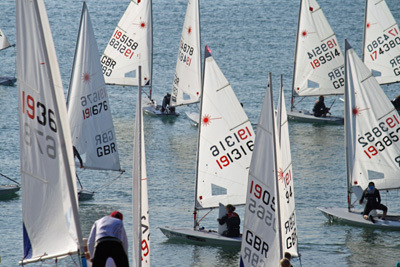 Eastbourne has hosted numerous national championships and open meetings over the years and has built up a wealth of experience in organising such events, which, in recent years, have included the RS800 and RS700 Nationals, Dart 16 Nationals, RS Volvo events, Laser World and European Qualifiers and Multihull Opens. The club has experienced race officers and we are well known for our efficient and friendly shore-side administration too. We have our own committee boat and safety boats and are able to call on neighbouring clubs to provide safety support for larger events. The sailing area in Eastbourne Bay is second to none, with fantastic wind and waves, set against the beautiful backdrop of Beachy Head and the South Downs. When we host multi-class events, we have the space and the ability to have two course areas, which makes for better racing for everyone. Whilst we do have a shingle beach, launching and recovery is not usually difficult and club members are often on hand to assist when necessary. We even have motorised winches to help boats up the beach, making life a lot less strenuous after a long day at sea! Being a holiday resort, Eastbourne has plenty of hotels and b&bs to accommodate visitors and there are plenty of activities and attractions for the non-sailing members of the family. We are keen to welcome more classes to Eastbourne and so feel free to talk to us about what we have to offer. 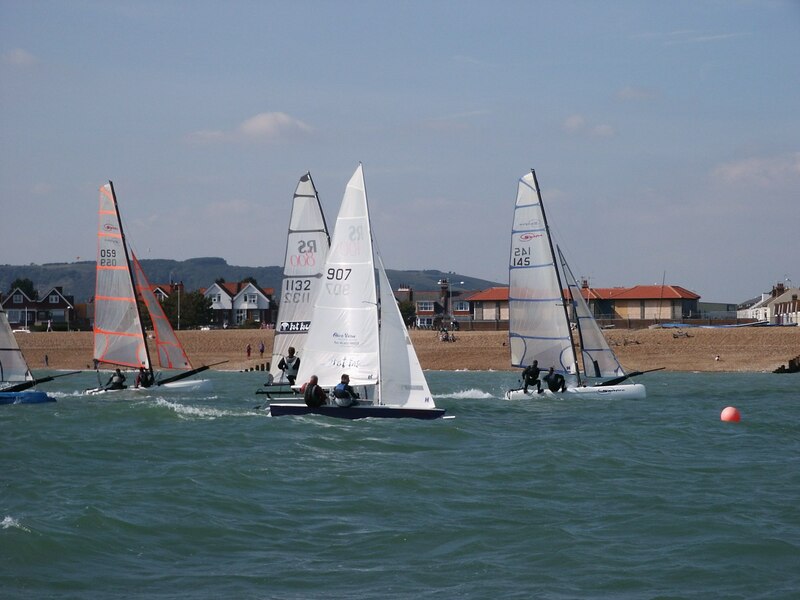 Eastbourne Sovereign Sailing Club offers a full training package through its Academy scheme. The academy scheme includes Start Sailing (formerly RYA level 1) and Basic Skills (formerly RYA level 2) over 5 Saturdays and a Sunday. We will get you use to using a mix of dinghies taking you from your 1st sail with an instructor up to being able to sail on your own on every point of sail. The course includes sailing theory and a controlled capsize recovery with a rescue boat in attendance. 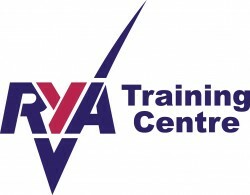 Academy Membership includes training up to RYA Level 2. The course covers 1 Wednesday evening, (1st May at 19:30), 5 Saturdays and 1 Sunday from 10:00 through to 17:00, (4th May until 1st & 2nd June). • Call in to the Club on a Saturday during our training season, or on a Sunday. • Contact Sail Training via our website. Eastbourne offers both class racing and handicap racing and we have a busy sailing programme, running from early March through to Christmas. Racing takes place on Sundays throughout the season and we also have a popular Wednesday Evening Series. Saturday sailing is very popular in the summer months, with many members either free sailing or attending one of the club’s training courses, or simply soaking up the sunshine on the club patio which overlooks the beach! Sunday racing comprises of 3 races for most of the season, with there being 1 race in the morning and 2 in the afternoon. The racing can often be viewed from the beach, although the race course will be further out to sea if we’re operating a committee boat start. Our courses are usually windward/leeward for asymmetric boats and either a trapezoid or a triangle for conventional boats. Our competitions range from class series throughout the season to a number of trophy events which are keenly contested! Our members sail a variety of classes, including Laser, RS800, RS400, RS600, Contender, Spitfire, A-class, F18, Laser and Dart 16. We also have a very popular Wednesday Evening series in the summer months. 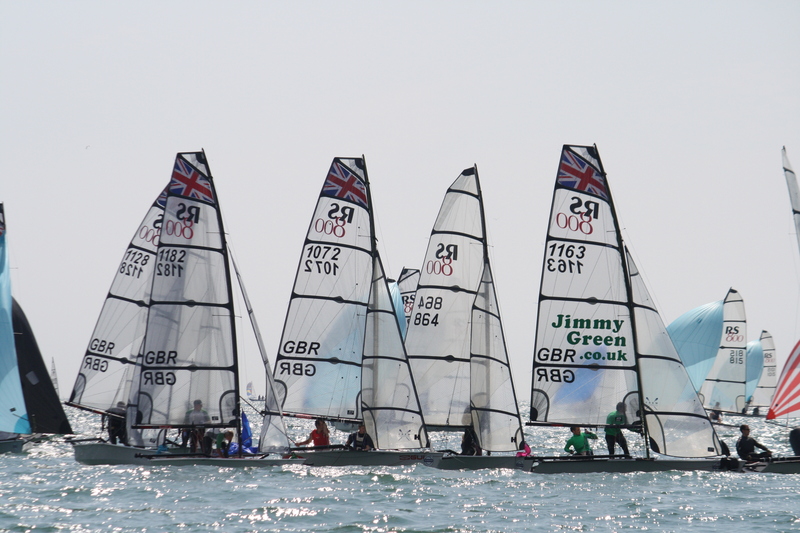 Everyone races as a handicap fleet, although there are additional competitions within the series for Lasers and Dart 16s. The Laser class have even come up with their own individual handicapping system, which has made for a wonderfully competitive series! The club’s own safety boat is on the water for all organised sailing and will provide assistance when required.